As well as appearing on the most recent series of Celebrity MasterChef and being a series regular on Mock The Week (BBC 2), Zoe’s extensive TV credits include Room 101 (BBC1), Dara O’Briain’s Go 8-Bit (Dave), Channel 4’s Comedy Gala, Live At The Apollo (BBC2), The John Bishop Show (BBC1), Alan Davies: As Yet Untitled (Dave), Pointless Celebrities (BBC1) and winner of Celebrity Mastermind (BBC1). Radio credits include The Frank Skinner Show and The Jason Manford Show (Absolute), The News Quiz, Just a Minute, The Unbelievable Truth, The Now Show, It’s Not What You Know and The Rest is History (BBC Radio 4). 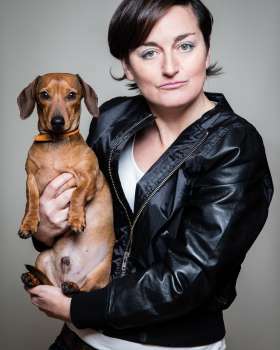 In 2018 Zoe Lyons returned to the Edinburgh Festival with a new show 'Entry level Human', which was praised by critics and audiences alike - and she is now on a nationwide tour. Zoe’s trademark high energy, brilliantly observed routines and sharply written material has left her with an ever-growing fan base. Last year she won both the Comedian’s Comedian Award and Chortle Best Club Comic. Zoe’s debut hour at the Edinburgh Festival gained her a nomination for the Perrier Award, and she has hosted the prestigious So You Think You’re Funny Final in Edinburgh for the last four years. Zoe is also a talented actress, having starred in Outings at the Edinburgh Festival in 2014, which was later transferred to the St James Theatre in London.